I wanted a remote control for my Canon EOS 550D/Digital Rebel T2i – I did not even think about any alternative but bought the original Canon RC-5. (Price €20 in Sweden) That is an infrared remote with just one button – nothing more! Well it has a hole to tie a string or lanyard to. It is powered by a small button cell CR2032 – that lasts several years with “normal” use. It does have a small “arrow” that indicates where the infrared LED is situated – or what direction you should point to the camera. Note! 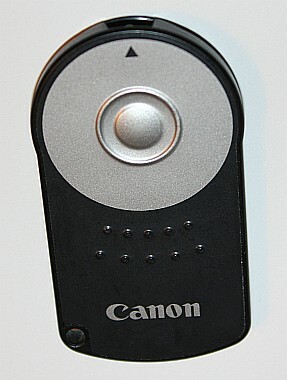 This remote works with a number of Canon DSLR cameras. There is also a newer model for the same price, the RC-6, that allows you to select with or without 2 second delay – so it is a better buy! Super simple to use! Just set the camera up for self-timer/remote and you are ready to go! You press the button on the remote and the camera responds with lighting up the yellow/amber light near the shutter release button. If you have the beep sound activated it will also emit a series of short beeps. Two seconds after you pressed the button on the remote the camera will take the picture. One more thing to be aware of is that the camera will only react to the IR-remote as long as it is “On” – quite naturally perhaps!? But it means that you will have to have the Auto Power Off set to a suitable time 30 secs-15 min or “always on”. This also means that the camera will draw power as it waits – I do not know how long it can be left “on” before the battery runs out – probably several hours at least but probably not days! You can lower the power consumption by switching of the display! The infrared sensor is placed near the top of the grip – just below the shutter release button. The camera will react up to just over 6 meters from the camera – at least indoors in a “cosy” lit room (that is very soft and low light). It also has a very wide sensor angle – amazingly close to 90 degrees(!) to the right of the camera – but then at a max distance of about 2 meters. 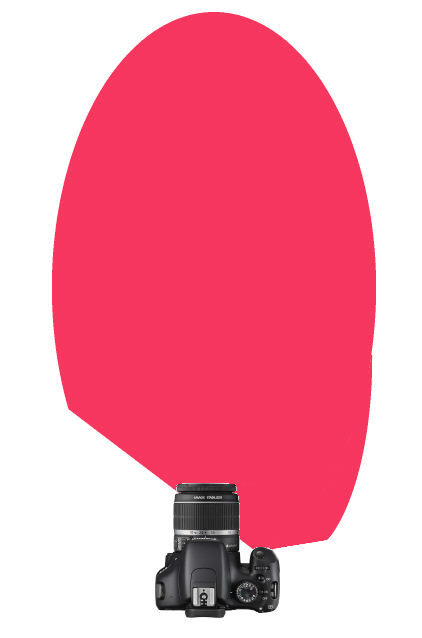 On the left hand side it depends on how much the lens and other parts of the camera is blocking the view to the sensor. The red area in the illustration marks the rough working area – but it is not to scale. This is quite a handy little device – very good also for the looong timed night shots – use the remote to avoid camera shake! It is also so small and light that it is easy to carry around with you. Moreover it can be used to start and stop the movie recording with! Very handy! But then the recording starts immediately – without the two second delay! Next will be a post about another remote I have – a wireless radio-remote – for the same price as the RC-5. This entry was posted on September 25, 2010, 21:56 and is filed under Camera Remote, Camera Stuff. You can follow any responses to this entry through RSS 2.0. You can leave a response, or trackback from your own site.